Of all the things Santa has to worry about on Christmas Eve, his underwear definitely shouldn’t be one of them. 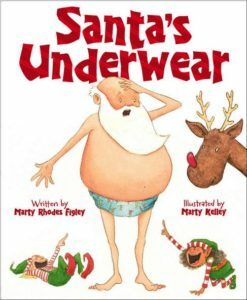 But undies are what has Santa in a quandary in author Marty Rhodes Figley’s latest holiday picture book, Santa’s Underwear. In the book, it’s Christmas Eve and Santa has eaten a sensible, balanced meal, shined his belt buckle, and even brushed his beard in preparation for his great sleigh ride. But when the time comes, Santa can’t get dressed because his undies are missing. They are red and saggy but they have always kept him warm on his long ride around the world on Christmas Eve. Although he considers his heart-filled valentine undies, his silly shamrock undies, and even his boring regular undies, none of them put him into the Christmas spirit. It’s only when he opens his closet and spies a new and thoughtful gift from his doting reindeer that he realizes this may possibly be the best Christmas ever. Santa’s Underwear is a quaintly adorable little book, full of laughing elves, curious reindeer, colorful undies, and an appropriately chunky Santa who only wants to get the Christmas Eve show on the road. 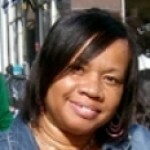 Ms. Figley’s prose is age appropriate (ages 4 to 8) and specially woven to tickle the funny bone. Artist Marty Kelley’s illustrations are hilarious. Young children will love the cheesing elves and their mischievous antics, the well-meaning reindeer, and the chubby, huggable Santa in his holiday undies. Great for early elementary classroom discussions about holidays and traditions, or cozy evenings around the family fireplace.